Third Battalion’s 2004 deployment involved operating high in the mountains away from major populated centers and fighting small teams of Taliban fighters. In Haditha, 3/3 would be doing most of its fighting in the middle of cities with tens of thousands of residents. In Haditha, 3/3 would often unknowingly encounter their enemies every day: at checkpoints, marketplaces, and mosques. It was heavy Algiers-style urban counterinsurgency. 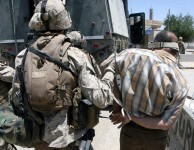 Kilo Marines detaining a suspect in Haqlaniyah, May 2006. While most people only know of the town because of the infamous 3/1 ‘Haditha massacre‘, there’s been comparatively little interest in the situation in the town at the time of the killings. Haditha was like Iraq’s version of Stafford, Virginia, or Jacksonville, North Carolina: a town full of retired military veterans, who flocked to the insurgency as soon as it broke out. To make matters worse the town occupied a crossroads between the Syrian border, Ramadi, and Salah ad Din Province which was vital to insurgent movement and supply in western Iraq. In other words, Al Qaeda in Iraq possessed both the means and motivation to contest the city. And they did. The 3/1 killings occurred in November 2005, but the story broke in the media in April 2006, right as 3/1 and 3/3 were conducting their turnover. Shortly afterwords, according to many Haditha veterans I’ve talked to, enemy activity exploded. There’s no doubt that this deployment was 3/3’s crucible in the Global War on Terror. 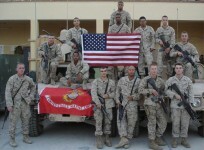 The battalion lost more Marines there than on every other GWOT deployment combined: 12 killed and 74 wounded. According to author Bing West in his book The Strongest Tribe: “[3/3] didn’t have the manpower to control the [main roads] and hold Haditha. The Iraqi Army was as blind as we were. The insurgents killed anyone who spoke to us.” Just two months after relieving 3/3 in Haditha, Second Battalion Third Marines (2/3) had lost 23 Marines. But numbers alone can’t explain what happened to 3/3 in Haditha. I’ve heard many similar stories from other 3/3 Triad veterans, some similar, some much worse. At the time, I was an impressionable Private First Class and wondered if they might be exaggerating. But even then there were signs: shortly after I checked-in, a practice drill by the base rifle team near the barracks sent dozens of Marines diving for cover on the catwalk. Site News: I’m still working the May SIGACTs and have added Operation CELTICS.